Powered Mobile Lift & Tilt Tables (PMLTT) are some of the most flexible work positioners available. Dual scissor lift and allow for a greater vertical range, while the all-steel tilt table achieves up to 45 degrees of pitch. This combination creates a variable-height workstation that allows staff to move contents of bulk containers closer to their bodies, preventing the musculoskeletal injuries associated with sorting parts and packing/unpacking crates. 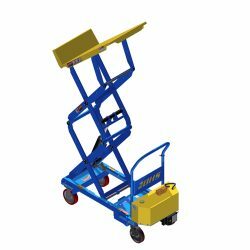 These fully portable units do not require the use of a lift truck or any other material handling equipment for positioning. An ergonomic push bar and heavy-duty casters allow a single operator to easily move the PMLTT from one location to the next, offering its ergonomic protections anywhere in the facility. Call the BHS sales team at +1 314 423 2075 to learn more about Powered Mobile Lift & Tilt Tables and other solutions to ergonomic challenges.